First line: On the morning of her arrest, Edna Heustis awoke early and put her room in order. Summary: In the third book of the Kopp Sisters series, Constance, the first lady deputy, strives to find justice for the women that are brought to the jailhouse. These women were arrested on morality charges but Constance is out to prove that these women are just trying to provide for themselves and have a little freedom. At the same time she has to find her sister, Fleurette, who runs away to join the stage show of May Ward and her Dresden Dolls. Highlights: I love that this is based on true stories. As I was skimming through the historical notes at the end of the book, I saw that the news articles about Constance Kopp appeared in the Wichita Beacon. As the first woman deputy, she had to fight the constant backlash from the people that believed a woman should not and could not be a deputy. She proves them wrong. Norma makes me laugh with her straightforward speech and tough demeanor. Lowlights: I feel that the story is slow moving with multiple storylines intertwined. The story could have been condensed and made a little shorter. 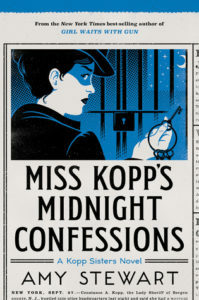 FYI: Check out the libraries database, Newspapers.com, and search for Constance Kopp. It is very interesting to see the real life woman and her stories.